*This story was originally published when The Prince and Princess Sadruddin Aga Khan Collection debuted in New York. It is being presented again in celebration of the exhibit of the collection at L’Ecole, School of Jewelry Arts, located at 31 rue Danielle Casanova in Paris, from April 4 to April 25, 2018. 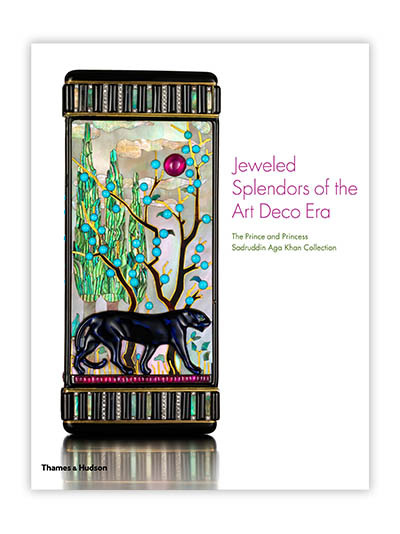 A mythic exchange between F. Scott Fitzgerald and Ernest Hemingway leaps to my mind when I think of the one room exhibit Jeweled Splendors of the Art Deco Era: The Prince and Princess Sadruddin Aga Khan Collection that opened last Friday, April 7, 2017 at the Cooper Hewitt Museum in New York. Literary scholars have now decided this hilarious dialogue never took place but was based on the writings of the two men. Whatever the case may be, they knew the wildly wealthy people in Paris during their Café Society days and surely saw splendor like the 113 objects in the exhibit that inspired the sentiments in their work if not their conversation. 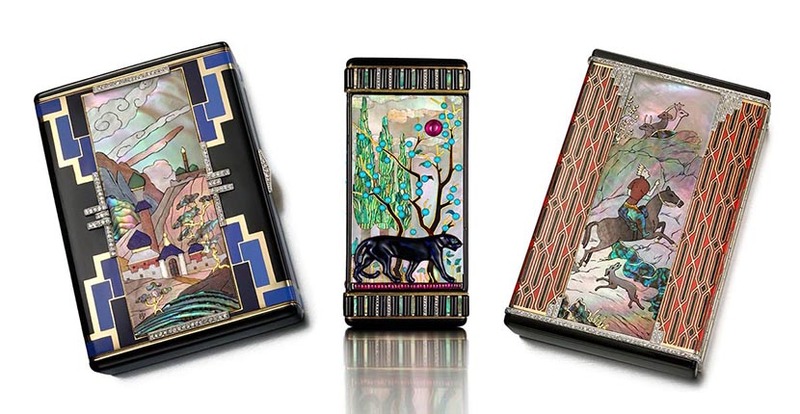 Individually the bejeweled vanity cases, matchstick holders and boxes may not be more valuable than the vast majority of the jewels in the sister exhibition at the museum, The Jazz Age: American Style in the 1920s, yet there is something in them that communicates a level of extraordinary wealth. While we have all seen vintage art deco jewels worn by celebrities on red carpets, we don’t see the accessories that once accompanied them. 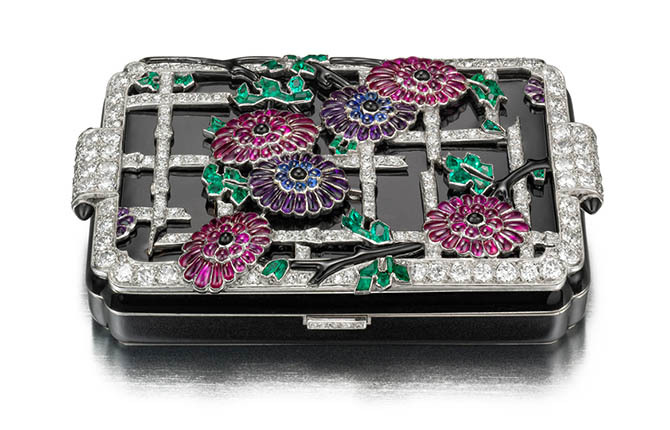 Imagine what it must have been like to be seated across from a bejeweled flapper at a party who proceeded to pull out her elaborately gem-set little vanity case to reapply lipstick and elegantly powder her nose. Just imagine someone scratching down a thought with her gold pencil in the mini notepad within the pearl and diamond Bunny Vanity photographed below. These are almost unimaginable acts from a Never Never Land. 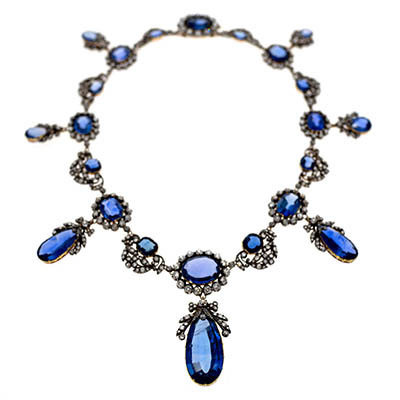 The collection of bejeweled objects at the Cooper Hewitt belonged to the Prince and Princess Sadruddin Aga Khan. 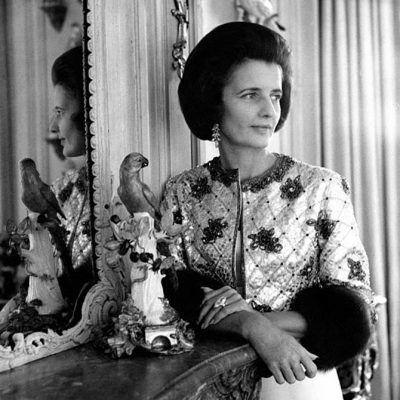 The Princess in this case was not the Prince’s first wife, the celebrated jewelry collector and former model Nina Dyer. It was his second wife, Catherine. The couple didn’t live during the era when the boxes were made. 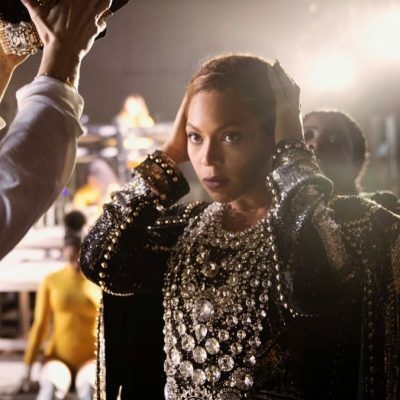 They were married in 1972 and started the collection in the period when the term art deco was dubbed and a revival of the style came into vogue. In the 1974 remake of F. Scott Fitzgerald’s 1920s classic The Great Gatsby, there were no less than 58 Cartier jewels worn by Mia Farrow and Lois Chiles. 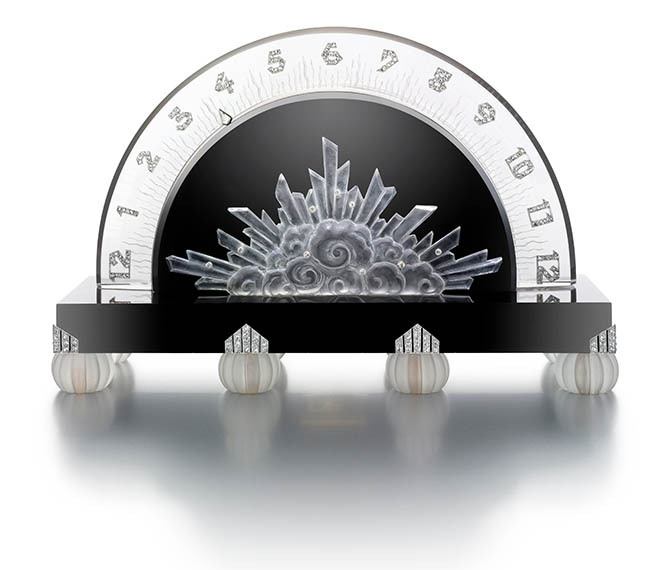 In 1976, Cartier staged its first ever art deco retrospective at the flagship Mansion in New York to rave reviews. Among those photographed by The New York Times admiring the presentation was Rita Hayworth’s daughter and Prince Saddrudin’s niece, Princess Yasmin Khan. With their passion for art deco one can’t help but think the Prince and Princess Aga Khan also attended the presentation. So in this sentiment, perhaps the princess is not so very different from you and me. She too found a Never Never Land form of luxury and escape in gazing at these art deco treasures. More highlights from the collection shot by the great still life photographer Doug Rosa are below. The pieces will be on display at the Cooper Hewitt in New York through August 27, 2017. The 256-page exhibition catalogue for the presentation is a stunning and comprehensive view of the objects with Rosa’s photos showing all sides and the interiors of several. There are also essays by experts on the subject and detailed descriptions about each design. 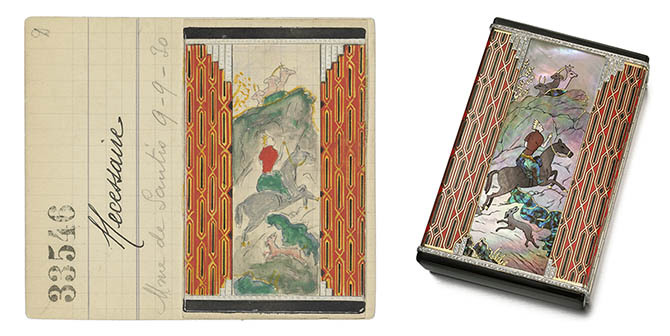 The 1930 Van Cleef & Arpels stock card depicting the Noble Hunt Case at right. The box measuring a little over 3 x 2 inches has compartments for cigarettes and a vanity with a fitted mirror. 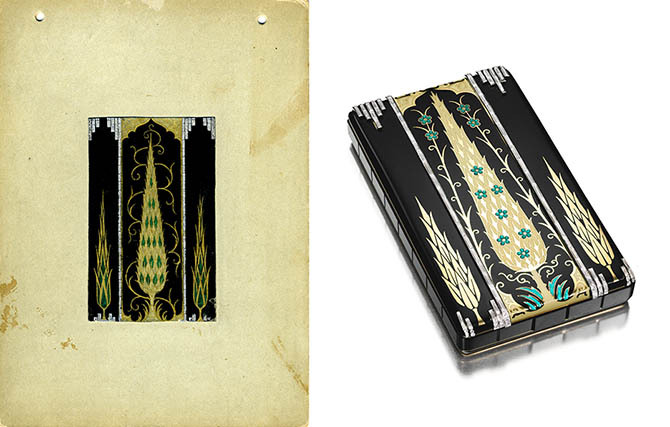 The mother-of-pearl and gem-set design was inspired by Persian miniatures, a popular theme in art deco objects. This vanity designed by Cartier in 1927 was manufactured by the esteemed French workshop Henri Lavabre. Note the subtle mosaic pattern of the lapis. 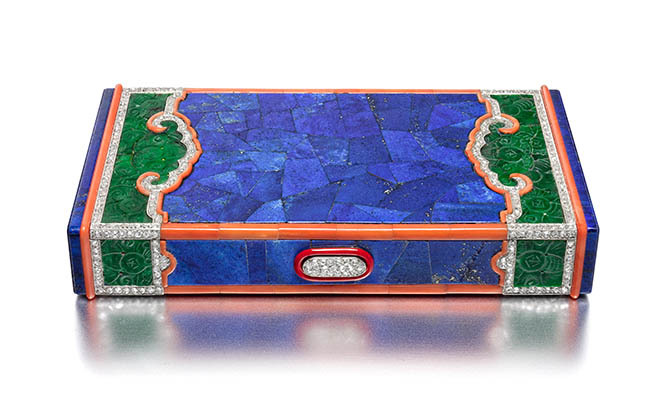 The gold and platinum box also features carved jade, carved ruyi, coral, diamonds and lacquer. 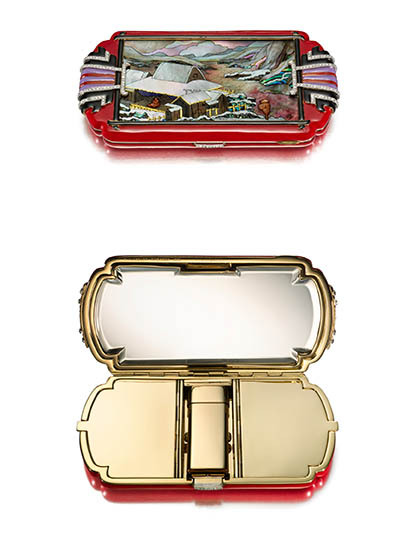 The interior has two powder compartments with powder puffs and a lipstick holder. It measures 3 7/8 x 2 1/16 x 11/16 inches. This Fern Compact was made in France around 1929. The piece is unsigned and the designer unknown. 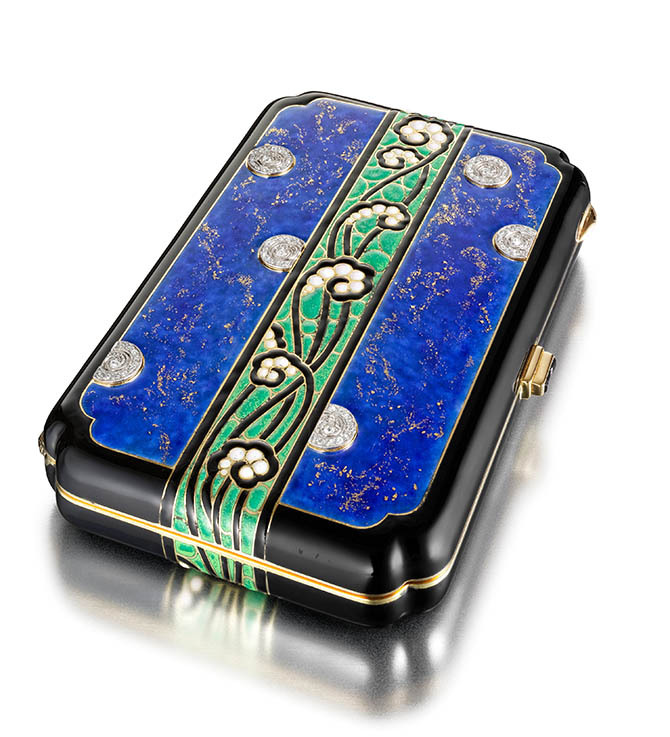 The gold and platinum compact is decorated with blue, black and green enamel accented with rose-cut diamonds. It measures 3 1/4 x 2 1/8 x 1/2 inches. 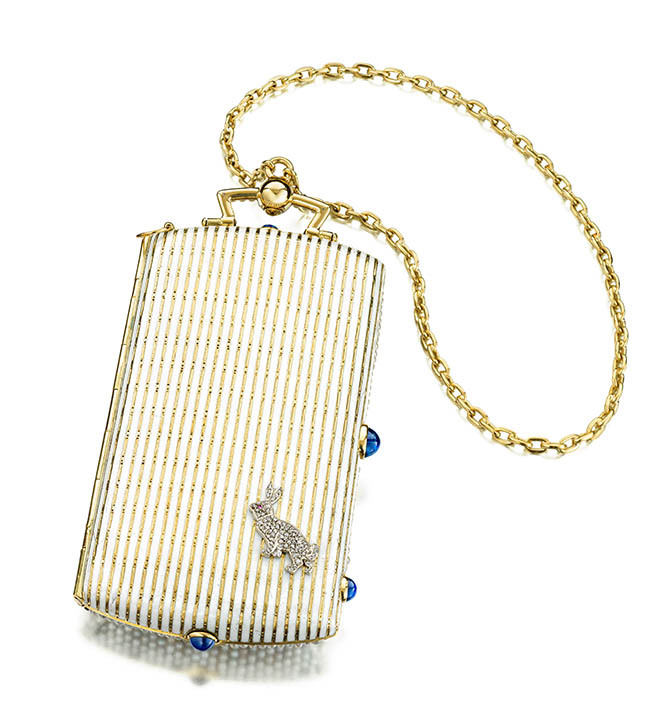 This adorable Rabbit Vanity Case was designed by Cartier around 1924. The design is set with seed pearls on the front (not seen in the photo). The reverse of the piece, shown above, has a white enamel and gold stripe pattern accented by a little diamond rabbit with a ruby eye. 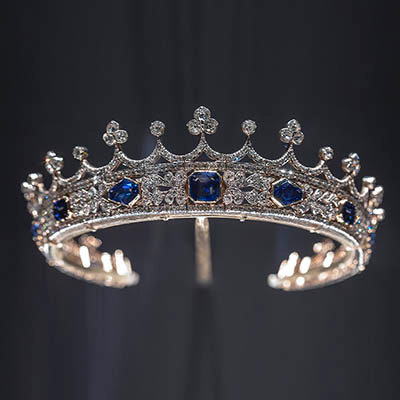 Sarah Davis writes in the catalogue that the little creature might have been a request from a client since it is out of character for Cartier designs. The cabochon sapphires on the sides of the jewel all function as push pieces of the complex interior. One opens the case. Others operate the lids for a writing pad, a powder compact and two lipstick holders. There is also a pencil on the inside. The case measures 4 1/8 x 2 x 11/16 inches.